This repo contains my first-ever R Shiny project. It’s simple, and represents a minimally viable app. 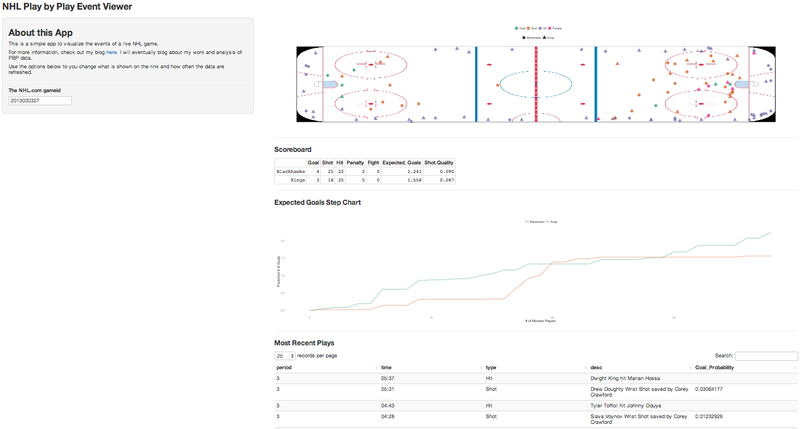 It’s super basic, but the app allows us to query and visualize the NHL’s Play-by-play event logs for a given game. I updated the app for the 2015-16 season. There are a few manual updates to the code that I could refactor and allow the end-user to set, but in the short run, it works. The app also leverages a simple shot probability model that I built. That repo can be found here. If you haven’t already, install R here for your OS. This should fire up your default modern browser. It will take a few moments to load the data, and will refresh every 20 seconds or so. When you want to quit the app, go back to the terminal and type CONTROL-C to kill the process. Clearly this is very unpolished, but just a quick highlight of the dashboard app. I have noticed that sometimes the app will fail with match errors on the MainPanel of the dashboard. – I am not sure if this is the NHL refusing a GET request to refresh the data or if there is a bug in Shiny. In my previous repo, I highlight a very proof-of-concept model. It’s not elegant, but very effective when estimating a player’s total season goals. With respect to the point estimates (actual probability of a shot going in), it has some room for improvement; AUC is mid .7’s. When applying the model to every shot from a player (identified by the NHL playerid), and correlating the actual versus predicted goals over the course of a season, the R-squared is a touch under .9. Better handle games. Need to change the helpers.R for each season.